Buy Bakson's Dr.Bakshi's Nasal Aid Spray Treats Blockage of nose, Nasal discharge- watery, thick, bland or acrid, Sneezing, Itching of nose, Loss of smell & Other symptoms associated with Allergic Rhinitis & Sinusitis. Helps relieve blockage of nose, nasal discharge -watery, thick, bland or acrid, sneezing, itching of nose, loss of smell and other symptoms associated with allergic rhinitis and sinusitis. Associated Symptoms of ENT Disorders. 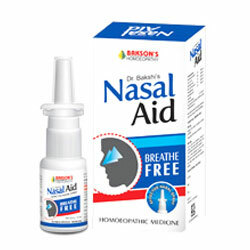 Dr. Bakshi's Nasal Aid is an instant acting composition that provides symptomatic relief from nasal congestion. Its direct acting solution acts by constricting the blood vessels in the nasal tissues, reducing swelling and feeling of congestion. Dr.Bakshi's Nasal Aid Spray contains effective homoeopathic ingredients which are useful to combat and relieve the symptoms commonly associated with Allergic Rhinitis and Sinusitis. It is safe and non habit forming composition. Other symptoms associated with AllergicRhinitis & Sinusitis. For persistent symptoms consult your doctor. Walt at least 30 seconds before blowing nose. Optimal results may come after 1-2 weeks. After 1-2 weeks, if improvement starts use only 1-2 times daily. For best results, use up to one week before contact with known causes of allergies especially during change of season. For best results take Bakson Aller Aid Tablet internally.